A drug commonly prescribed to lower blood pressure is not effective in reducing cardiovascular deaths and heart attacks, research suggests. A team from Umea University Hospital in Sweden reviewed studies comparing the beta blocker atenolol with dummy pills, and other anti-hypertensives. It was no better than placebos, and less effective than other drugs at cutting heart attacks and deaths. The research is published in The Lancet medical journal. There a very good reasons why patients should not suddenly stop taking beta blockers. The researchers collected data from four studies involving 6,825 patients that compared atenolol with a placebo or no treatment. Results from a further five studies, comprising 17,671 patients, which matched atenolol against other blood pressure lowering drugs, were also analysed. Researcher Dr Lars Lindholm said: "We have some doubts about the suitability of atenolol as a first-line antihypertensive drug and as a reference drug in outcome trials of hypertension." Belinda Linden, a cardiac nurse at the British Heart Foundation, said in the UK beta blockers were not the first line choice of medicine to treat high blood pressure, but the fourth choice, and often used in combination with other drugs. However, she said most people needed to have at least two drugs to reach the recommended blood pressure goal. As well as being prescribed for lowering blood pressure, it was used to combat angina and administered to patients after heart attacks. Professor Neil Poulter, an expert in cardiac medicine at the National Heart and Lung Institute, told the BBC News website that there had been doubts about the effectiveness of atenolol for some time. He said it was possible that the drug increased blood sugar levels, or had an adverse effect on cholesterol. He said the National Institute for Clinical Excellence recommended a combination of beta blockers and diuretics to treat hypertension. However, the British Hypertension Society had concerns that the combination could increase the risk of diabetes. Professor Poulter said a major trial of 19,000 patients was underway in which the beta blocker/diuretic combination was being compared to another combination of drugs - an ACE inhibitor and a calcium channel blocker. However, he said there was no reason at this stage why people who were taking beta blockers should stop their medication. "There a very good reasons why patients should not suddenly stop taking beta blockers. If they were to stop then it should be done gradually and under the close control of a physician." 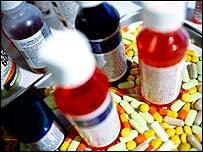 The drug was originally developed by drug giants AstraZeneca, whose patent expired in 1991. A spokesman for the company said: "We believe that this study is inconclusive." Hypertension is known as the "silent killer" because it can go undetected for years while damaging arteries and putting a strain on the heart. It is a leading risk factor for heart disease, stroke and kidney damage. A estimated one in four middle-aged UK adults, and half of people over the age of 65, have high blood pressure. Blood pressure readings above 140 over 90 millimetres of mercury are defined as "high". The first, systolic, reading is the pressure each time the heart contracts. The second, diastolic, reading, is the pressure between beats.